I have been pretty busy with work and Bill's dad is now at the Comfort House Hospice house to get his pain and nausea under control. I don't know that he'll come home from there but we are all aware that it is nearly time for him to go home. We will all greatly miss him and I am so blessed to have been able to have him for a small part of my life. I lost my father 24 years ago and I was definately "daddy's girl". My father-in-law has been like a father to me for the last 17 years and this is just like loosing dad again. 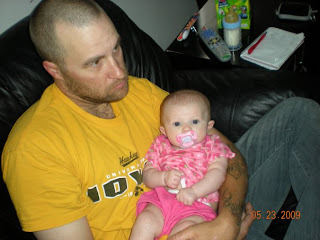 So anyhow I thought I would attach a picture of our youngest granddaughter who is also a "daddy's girl". Thank God for her. Her daddy (our youngest son) thought he could never be a good dad. Imagine that!! God bless you all and I pray that my daddy comes and brings my father-in-law home soon. Tammy I want you to know I'm also thinking about you losing your "daddy". It is very hard to lose a father or father in law. I understand [I lost both mine withing three months in 2005]. I'm thinking of you both. Thanks Val. I don't think it will be long now. I pray it's almost over for him. We're heading to the hospice house now. Thank you all for any support and prayers you may feel necessary to give. God bless you all. My thoughts also are with you, and like Val said, this has to be a very tough time for you all. 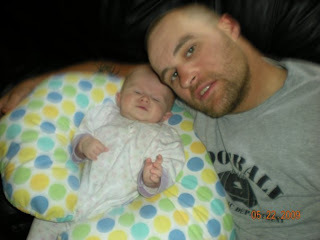 It's so nice that you are able to enjoy your son as he gets to love and cherish his little "daddys girl". Very nice photos of him and your grand daughter. I lost my daddy too. It just seems to happen. had a horse and knew how to saddle it and bridle it and take care of it. I forget how important that has been in my life. My children are suffering the loss of their daddy. Almost 6 months now.